‘Gloriously sung’, said The Independent, ‘while chorus and orchestra honoured the full beauty of the score’. 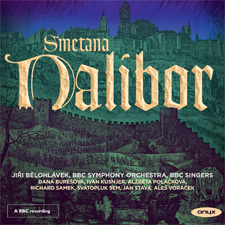 The failure of Dalibor to rival the success of The Bartered Bride always pained Smetana: ‘Perhaps after time, recognition will come for this opera’, he wrote in 1877. This performance does full justice to the work, now recognised as containing some of Smetana’s finest music.